I had arranged with yesterday’s driver to take a short break on Sunday for a spot of tourism. A quarter of an hour after the allotted time, he was nowhere to be seen. A phone call revealed the cause to be ‘no car’. While taking a substitute stroll through the town, I noticed a distinct lack of vehicles. Dogs were snoozing in the middle of the road, people played badminton across the street and there was even a rather oddly shaped pony munching vegetation unhindered by cars and bikes. A local informed me that cars are banned from the town on the first Sunday of the month. The penny then dropped. The driver was trying to say ‘no cars in the town’. I guess he could have left a message at the hotel to meet just outside of the town, but perhaps he didn’t need the money that much. 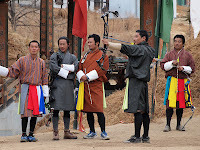 My wanderings took me past an archery competition in Changlimthang Archery Ground. 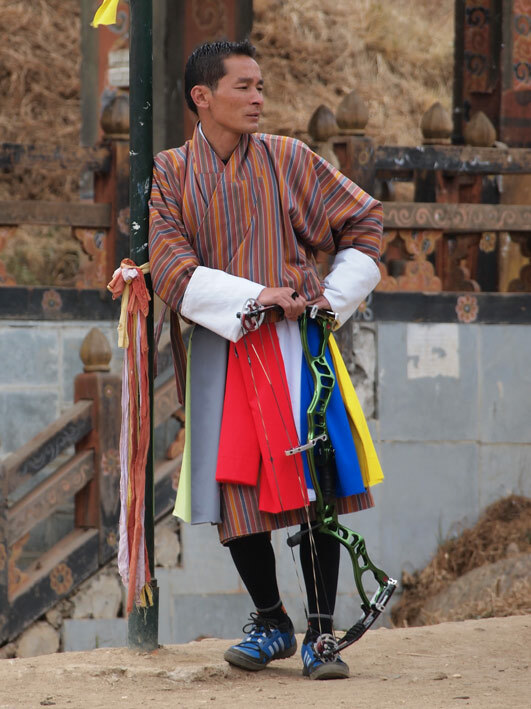 The competitors dressed in national costume took it in turns to aim at a target the size of a dartboard located 100 metres in the distance (I checked it on Google Earth). 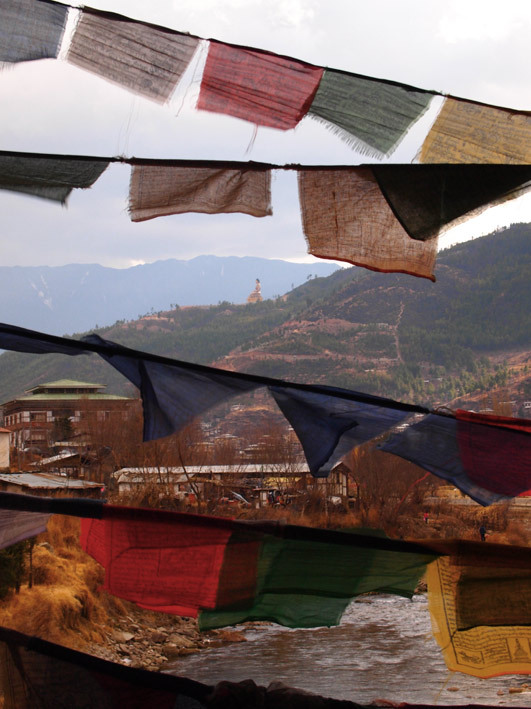 Every so often three or four of the group would gather to sing and dance in a ritualistic manner. After emerging from their shelter, the chaps at the target end would also celebrate with slow dance routines and chants before rapidly taking cover as the next arrow arrived with a puff of dry soil in the vicinity of the target. I continued passed the stadium and crossed the wooden bridge to the handicraft market from which Mrs M would not have emerged without emptying her purse. On the other side of the river, the covered farmers’ market was crammed with locals selling colourful fruit and vegetables from neatly arranged tiled stalls, although nobody seemed to be buying. 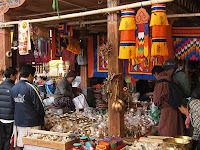 The edge of the market was less organised. As I left the area through the lower market, I passed a house where animal skins drying on horizontal poles gave off a particularly unforgettable aroma. I shall add it to my library of smells from around the world. Back at the hotel, I finished preparations for the following day, ironed a couple of shirts with the toy iron and headed for dinner. 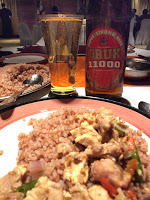 The atmosphere inside the hotel restaurant was uninspiring. Last night’s buffet was particularly disappointing and breakfast was in a category just above dismal. 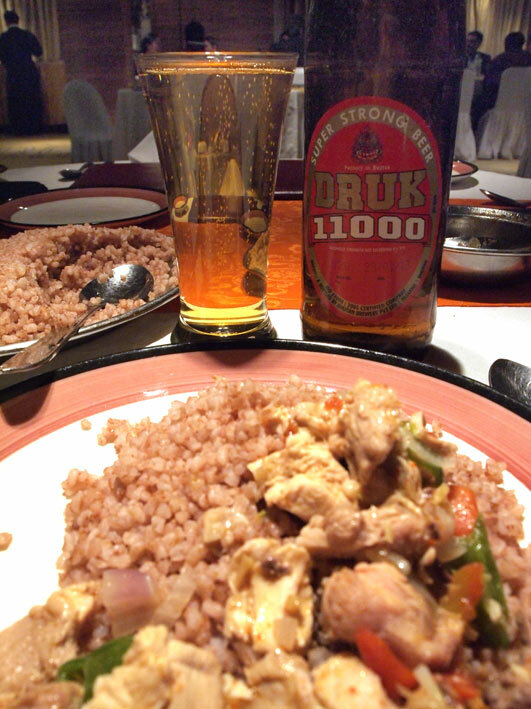 With the help of the waiter, I chose a Bhutani dish of Jha Sha Tscheom (chopped chicken) with red rice and a bottle of 'Super Strong' Druk 1100 beer, the label of which claimed that the strength was less than 8%! 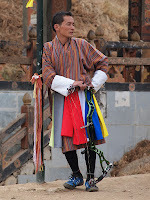 I had read that Bhutanis like bones, skin, fat and even a few whiskers or feathers with their meat. This proved to be quite accurate.